The Nashville Task Force on Refugees & Immigrants meets today, Tuesday May 30 at 2:00pm at 2200 West End Ave, Nashville, TN 37203-5204, United Methodist Church, Room 318. Free parking behind the building (map here). The task force meets on the last Tuesday of the month. Members of Nashville Latino Health Coalition and Hispanic Community Group of TN invite organizations and individuals to participate in a community health event on June 10th, and to get involved in this coalition. Amber Beckham describes the Network of Emergency Trafficking Services (NETS) and announces an upcoming June 20th training opportunity how to identify and assist victims of Human Trafficking. This training event is tailored to social service providers and interested community members. The National Association of Hispanic Real Estate Professionals (NAHREP) Middle Tennessee Chapter invites to a May 31st event with Vice Mayor Howard Gentry. Nashville welcomes a new reporter, Mr. P.J. Tobia, who started working for the Nashville Scene. P.J. Tobia specializes in reporting on human rights and refugee/immigrant rights. P.J. Tobia will describe his prior work with refugees in the U.S. as well as his assignments in Africa. In Nashville, he is looking for sources and leads to stories on human trafficking (sexual and/or labor exploitation). For confidential leads, call 615.844.9400, or meet P.J. at the Task Force. Nashville further welcomes reporter Mr. Gilberto Alvarado, who started working for El Crucero News. Mr. Gilberto Alvarado covers topics involving immigration reform and immigrant rights. Mr. Alvarado will give a summary of his interests and work. Contact phone 818.926.2443 or meet Gilberto at the Task Force. Tennesseans Against Genocide (TAG) announces a June 13 educational meeting on Sudan. Jack Kennedy gives a synopsis and overview of a frequently updated website on immigrant affairs: www.lacomunidadusa.com. Other announcements include updates on multilingual legal services, immigration reform, ESL, citizenship and small business classes for immigrants. Fulfilling (and in some cases self-fulfilling) the pundits' prophecies in 2005 that immigration would be a "vibrant" political issue in 2006 (story here), local exclusionists see Hispanic immigrants as a threat and are increasingly professing their views in anger, according to this article in the Nashville City Paper and this article in the Tennessean. "On Web sites, talk radio shows and in interviews, anti-illegal immigration activists describe Hispanic migrants as lawless, disease-ridden 'invaders' waging an undeclared war against the United States." "'The illegals coming to this country are turning the nation into a Third World country,' said [Clarksville resident Delfina] Espinoza, who met her husband, when he stopped her near the Mexican border, incorrectly suspecting she might be an illegal immigrant. 'They take no pride in America and have no respect for anyone.'" "Beyond concerns about unemployment, declining wages and over-tapped public services, many activists say their primary fear is that the sheer number of Hispanic migrants will drown American culture." "Many books and articles touted by the anti-illegal immigration movement carry dire warnings of impending race wars as hordes of Hispanics bent on re-conquering America convert middle-class suburbs into Mexican barrios." "'What you are seeing happen is the destruction of our way of life,' [according to Tennessee resident Theresa Harmon]. 'Anytime you see a nation go over to an entirely different culture and different nationality, you're going to see a fight.'" "'Slaves helped build this country, and what you have here are invaders who come here with arrogance and demand to get all the things we worked for,' said Michael Holt, 51, a Bordeaux native who retired from an aircraft part manufacturing plant in Nashville." "In Blount County last year, two men were sentenced to four and a half years in prison for vandalizing and painting Nazi symbols on a Mexican food store in Maryville. Also last year, a federal judge sentenced former correction officer and KKK member Daniel James Schertz of South Pittsburg, Tenn., to 14 years in prison after he pled guilty to making five pipe bombs to blow up a bus carrying Mexican workers from Tennessee to Florida." Nationally, "U.S. Rep. Tom Tancredo, a Colorado Republican who chairs the 92-member bipartisan House Immigration Reform Caucus, told a group of activists last year that illegal immigration is part of a global plot to destroy America." "Before Rep. Luis Gutierrez could wrap up a recent round of appearances on conservative talk shows, some angry callers were lighting up the switchboard in his Washington office and demanding the seven-term congressman go back to Mexico." "Only Gutierrez, D-Ill., was born in Chicago and is of Puerto Rican descent." "Sen. Ken Salazar, D-Colo., also in the forefront of the immigration debate, says he, too, has received nasty calls and e-mails." "Salazar said he has been accused of being involved with the issue only because of his Mexican-American background. Yet, he said, his family has farmed the same land 150 years in southern Colorado and his family founded Santa Fe, N.M., 408 years ago." "In recent weeks, Rep. Linda Sanchez, D-Calif., the only Hispanic on the House Judiciary's immigration subcommittee, has received three red bricks, each wrapped in a note telling the congresswoman to use the brick to help build a wall along the Mexican border. None of them came from her district, spokesman Jim Dau said." Tennessee's exclusionist representatives are getting some of the same bricks. "Other lawmakers, including non-Hispanic House members such as Rep. Marsha Blackburn, R-Tenn., also have received bricks but welcome the gesture. Six bricks are stacked in Blackburn's office." Blackburn was elected to the House in part because of her prominence as an exclusionist. "The rabble vote--the Chinamen do not; therefore, protect the rabble, and down with the Chinaman! The Democratic party of this State is set against the Chinamen and their cheap labor. They always come in at all conventions with a resolution denouncing the Chinese as a dangerous class, whose coming ought to be arrested at once, and means be employed to remove those already here. You are told by the Democracy that they are heathens, and their coming will demoralize this State, and all other sections, whenever they get a footing. Now and then you will find Republicans talking in this same strain. I think some move, as usual for a number of years past, has been made in Congress this winter to arrest the immigration to this country of these Celestials. Now, in my mind, a Chinaman has the same right to come to this country, find a peaceful home, breathe the free air of liberty, and be protected in his person, his family and property, as any one else. We have boasted, for a century past, that this is a land of refuge for the oppressed and down-trodden of all nations; that under our flag the family of man might gather, assured of 'life, liberty and the pursuit of happiness.' For a century we have accepted the grand announcement as true, that God has made of one flesh all the nations that dwell on the face of the whole earth, and that all have the same inalienable rights. Let us stand by these grand old truths, and bid the Chinaman, the Japanese and all others, welcome." "It is also unsatisfactory to some that the elective franchise is not given to the colored man. I would myself prefer that it were now conferred on the very intelligent, and on those who serve our cause as soldiers." Booth assassinated Lincoln three days later. The House bill has been the one described as "enforcement only", but even the Senate bill leaves plenty of dead-ends for illegal immigrants to get stuck in, without any hope of future legalization. Many people will be unable or unwilling to satisfy the more burdensome requirements for legalization (like having to leave the country and apply for re-entry), and the Senate bill as passed does nothing to change the fate of expatriates who are illegalized after April 5, 2006. This guarantees that some of the current generation of "illegals" will remain illegal, and new arrivals will be subjected to the same regime we have now, even if the House were to cave and accept the Senate bill intact. One wonders how the Senate bill could be called "comprehensive" if there will still be millions of illegalized immigrants after its passage? In 2005, every Tennessee congressman except Jim Cooper voted for the House bill. The Nashville Area Hispanic Chamber of Commerce cordially invites you to be our guest at a program and reception with keynote speaker Mr. Greg Gonzales, Commissioner of the Tennessee Department of Financial Institutions. “Banking in Español - Beyond the Language Barrier” is part of the NAHCC on-going Community Education Forum Series hosted in partnership with the Tennessee Human Rights Commission. Our program will include an award ceremony for students who have participated in “Hit the Books” an after-school tutoring program created by the Boxing Resource Center. With support of our members we at the NAHCC believe we can help "Hit the Books" become bigger and stronger, supporting their efforts to provide advancement opportunities for our youth. Please join us in support of a very valuable program for our community. The BRC is located at 418-D Harding Industrial Drive (off Harding Place) in Nashville, Tennessee. This event is FREE and open to the public. Please call 615-216-5737 or e-mail us at nashvillehispanicchamber@yahoo.com if you would you like to highlight your business at this program. 5:30 pm "Banking in Spanish"
*There are three Hispanic chambers of commerce in Middle Tennessee: the Tennessee Hispanic Chamber of Commerce, the Nashville Area Hispanic Chamber of Commerce, and the Franklin Area Hispanic Chamber of Commerce. The national U.S. men's soccer team will play Morocco in an exhibition game in Nashville tonight before heading to Germany in June to play in the prestigious World Cup. The U.S. team is ranked in the top five in the world, which is the best the U.S. team has ever been, according to this article in the Nashville City Paper, which warned that a low turnout would be a significant missed opportunity for Nashville, considering the high-calibre level of the team and their imminent appearance in the World Cup. A low turnout would also hurt Nashville's hopes of becoming a World Cup qualifier city in 2010. Recent crowd estimates are hovering around 20,000, thanks in part to the support of enthusiastic local soccer clubs, according to this article in the Nashville City Paper. "The game has already outdrawn previous soccer exhibitions held at the Coliseum. In 2004, an exhibition game between Tecos of the Mexican Soccer League and the Los Angeles Galaxy from Major League Soccer drew 11,198 fans. The U.S. Women’s National Team’s exhibition with Canada drew 10,432 fans." "Last summer, an exhibition featuring two teams from the Mexican league failed miserably, drawing somewhere between 2,000 and 5,000 fans." Today's papers preview the match, including this story in the Tennessean and this story in the Nashville City Paper. This second article in the Nashville City Paper says that the starting lineup is still under wraps. Play will begin shortly after 6:00 p.m. Tickets are still available for between $18 (behind goal) and $125 (Club Level), plus $10 for parking at the Coliseum. The match will also be broadcast on ESPN2. The Tennessean reports in this article that stepped-up efforts to enforce existing immigration laws will put more families behind bars but help the business outlook of Nashville-based Corrections Corporation of America. CCA has seen a 59% increase in revenues from immigration incarceration since 2001, according to a graphic published with the story, and one prison that was previously scheduled for closure was recently re-opened to house immigrant families. "At the T. Don Hutto Residential Center in Taylor, Texas, there's a playground for children and murals painted on the walls. There's carpet on the floors of detention cells but no locks on the doors." "Only the second detention facility in the nation designed to house families, the center is part of a new push by U.S. immigration authorities to detain rather than release illegal immigrants awaiting deportation." "The location is owned and run by Nashville-based Corrections Corporation of America, which, like other private prison operators, is bracing for an increase in business from measures to curb illegal immigration. The Hutto Center opened last week under a contract with the U.S. Immigration and Customs Enforcement agency, reversing last year's decision by CCA to shut down the then-underutilized prison." "'It's a tremendous opportunity for CCA because they have some empty facilities,' said Richard Crane, a Nashville privatization consultant and director of Houston prison operator Cornell Cos."
Forbes magazine reported in 2005 that private prison operators like CCA are finding their economic salvation in sharp increases in federal incarcerations (story here). In December 2003 CCA named Donna Alvarado to its board (story here). Ms. Alvarado is the only woman and only Hispanic on CCA's board of directors. Update 8:24 a.m.: Vanderbilt student Gentry Underwood has created this video about immigration detentions, which was featured on Democracy Now. Tennessee's senators are casting identical votes for every amendment so far to the Senate's immigration bill. Descriptions of the amendments and corresponding vote tallies are below. Some local advocates, concerned that any reform will be so narrowly tailored as to help relatively few of the millions of currently undocumented, are especially in favor of a particular pending amendment which calls for a so-called Orange Card, which would be issued to a broad number of immigrants for legitimacy prior to obtaining a green card. The number for the U.S. Capitol switchboard in Washington is 202-224-3121. Update Sunday May 21: The San Jose Mercury News reported in this story that the Senate debate on the immigration bill has been relatively civil and productive: "[I]n a town where we're used to the real decisions being made behind closed doors, senators got down to the nitty-gritty as they talked about and voted on about a dozen amendments. ... From how many new guest workers should be allowed into the country to whether undocumented immigrants here now should be legalized to whether English should be the national language, you got a feeling that some senators were actually making up their minds how to vote based on what their colleagues were saying on the floor." To prohibit the granting of legal status, or adjustment of current status, to any individual who enters or entered the United States in violation of Federal law unless the border security measures authorized under Title I and section 233 are fully completed and fully operational. To prohibit implementation of title IV (which includes the proposed guest worker program) and title VI (which includes the provisions relating to the 11 million undocumented workers) until the President determines that implementation of such titles will strengthen the national security of the United States. To make certain aliens (people who have committed serious crimes or have absconded after on order for their removal) ineligible for adjustment to lawful permanent resident status or Deferred Mandatory Departure status. To increase the amount of fencing and improve vehicle barriers installed along the southwest border of the United States. To strike the provisions related to certain undocumented individuals (narrowing number of immigrants to whom reform law applies). To modify the conditions under which an H-2C nonimmigrant may apply for adjustment of status. To amend title 4 United States Code, to declare English as the national language of the United States and to promote the patriotic integration of prospective US citizens. To declare that English is the common and unifying language of the United States, and to preserve and enhance the role of the English language. To establish a grant program to provide financial assistance to States and local governments for the costs of providing health care and educational services to noncitizens, and to provide additional funding for the State Criminal Alien Assistance Program. RESULT: 5/18/2006: Amendment SA 4072 not agreed to in Senate by Yea-Nay Vote. 43 - 52. Record Vote Number: 133. To require aliens seeking adjustment of status under section 245B of the Immigration and Nationality Act or Deferred Mandatory Departure status under section 245C of such Act to pay a supplemental application fee, which shall be used to provide financial assistance to States for health and educational services for noncitizens. "The pilot program, 'Los saludables,' meaning 'the healthy ones,' will offer a wide range of national discounts, informational newsletters and lectures, free flu shots and health screenings for a $15 annual fee." "Hispanics, with a higher incidence of diabetes, stroke and heart disease than whites, will benefit through the program's mission of awareness, [MaryAnn Hodge, executive director of H2U] said." "H2U would like to launch three to four more Spanish affiliate programs this year, Hodge said, depending on [the Miami program's] performance." In response to the rising number of discrimination complaints from the Latino population in the greater Nashville area, the Metropolitan Development and Housing Agency (MDHA) and the Tennessee Fair Housing Council (TFHC) will present a seminar for organizations that work with the Latino community. The seminar will help attendees detect housing discrimination and describe the resources and services available to those whose rights have been violated. The seminar is free of charge, and light refreshments will be available. Don't miss this opportunity! When: Thursday May 25, 2006 at 2 p.m. The Tennessean reports in this article that Miami lawman Augustin Clemente Jr. is the newly minted chief of police of Smithville. The police force of 11 is responsible for a municipality of 4,000. Clemente is believed to be the first Hispanic police chief in Middle Tennessee. "Clemente said he was surprised he got the $35,900 job. Not because he's Hispanic, but because he is not a native Tennessean. He figured the job would go to a local candidate." "Fewer than 5 percent of Smithville's residents are Hispanic or Latino, according to the 2000 U.S. Census, the latest figures available, and the new chief enjoys the fact he is believed to be the first top city lawman in Middle Tennessee with Hispanic roots. But he said he was not going to flaunt it." "'I'm more proud that I'm a chief. This has been a lifelong dream of mine. I feel I have accomplished the American dream. This would have never happened anywhere else but in the United States,' he said." Mayor Cecil Burger has high praise for Clemente, telling the Tennessean, "I can already tell he's getting things in right order. He's going to be good for the city. I mean, he was in Miami for a long time. I think he can probably handle Smithville." "Clemente, who likes his friends to call him 'Gus,' said his family fled Castro's Cuba in 1966 when America welcomed Freedom Flights of hundreds of families from Havana." The Tennessean reports in this column on Nashville history that "The Dec. 28, 1856, issue of the Union and American details a public meeting 'of the citizens of Davidson County' at the state Capitol on Dec. 24. A resolution was adopted ordering magistrates and constables in each civil district to 'serve legal notice on all free Negroes within such district to leave the state, who are here without authority.'" A state-wide law which had been on the books since 1806 required free African-Americans in Tennessee to carry "certificates of freedom" with them at all times. These certificates were required to participate in civic life; states like Ohio imposed fines on employers who hired African-Americans who did not have a certificate of freedom. In 1831, the desire to force free African-Americans out of Tennessee heated up when the state legislature passed a law that made it illegal for newly freed African-Americans to stay in Tennessee upon their emancipation. In 1854, the Tennessee legislature passed another law making it even clearer where the voters of the state stood in terms of popular sentiment toward former slaves: all emancipated slaves were to be sent to the west coast of Africa. Tennessee wasn't the only state trying to rid itself of free African-Americans. In 1806, the Virginia General Assembly effectively illegalized all its emancipated slaves, ordering any freed slaves who were still in the state in 1807 to be sold back into slavery. Illinois changed its state constitution in 1848 to prohibit free persons of color from immigrating to Illinois, and in 1853, the Illinois legislature made it a crime to bring a free African-American into the state. At the same time of the "citizens of Davidson County" resolution in 1856, the Nashville-based Southern Methodist Publishing House published, and the federal court for the Middle District of Tennessee recognized, this lecture on the morality of slavery, which gives insight to the popular sentiment that gave rise to the Davidson County resolution. Of particular parallel to modern political thought are lecturer William A. Smith's conclusion that there could be no government without slavery - and his argument that the state has no more obligation towards the "uncivilized race which may chance to dwell within [our] borders" than the obligations it owes to "savages on our border." 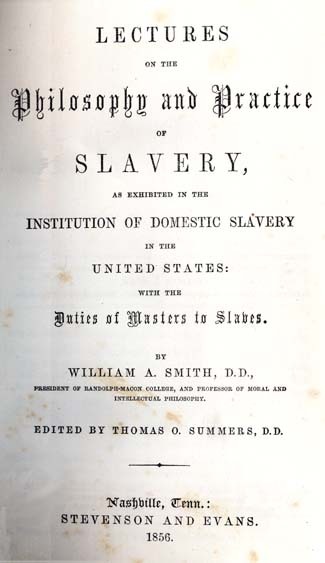 "In maintaining the institution of domestic slavery we are either right or wrong, in a moral point of view," Smith wrote, acknowledging that neither necessity nor ignorance would be an excuse for moral error. Nashville Scene food critic Kay West reviews the La Hacienda Marisqueria in this article, declaring that there is "no better place in Nashville for a harmonious convergence" of seafood and Mexican food. West shares more than her opinion of the food in this column. She also tells the story of the original La Hacienda, a Nashville staple. Tragically, the narrative is punctuated by the brutal attack on founder Carlos Yepez's mother-in-law and the murder of his father-in-law (story here) (despite a lead (story here) and a reward (story here), that murder has not been solved). The Tennessean reports in this article that new U.S. citizens in Tennessee are more likely to be Asian than Hispanic. Of the 2,613 people who became U.S. citizens in Tennessee in 2005, only 177 were from Mexico, and only 97 were from South America. The article does not report the relative numbers of citizenship-eligible Asians and Hispanics in Tennessee. The Nashville City Paper reports in this article that "[d]espite playing their best game of the young season, the Metros had to settle for a 2-2 tie with the Atlanta Silverbacks in their home opener Saturday night." "Nashville (0-1-2) vaulted to a 2-0 halftime lead on goals by Igor Stjepic and Pasi Kinturi. But Atlanta rallied for two goals, both by Damone Priestley, in the final 10 1/2 minutes to salvage the tie before about 400 fans at Ezell Park." Two stories in the Tennessean feature local women who have made journeys of compassion to Central America, one to Honduras and the other to Panama. "'I have lived in subsidized housing, faced unemployment, struggled to finish my degree, worked free-lance for years, raising my kids to the best of my ability . . . all by myself,' Rogers said." "After two broken marriages and a roller-coaster ride of jobs, she enrolled at MTSU in 2004 in theater to complete an undergraduate degree abandoned years before." "But with all her personal concerns, she never lost her passion for the people in Honduras." "'When I first went to Honduras, I realized I had a lot in common with the women there," Rogers said. "Single moms trying to raise their children against all odds — needing resources, wondering where to turn to find them.'" "In 1999, letters from her best friend's brother, who was in the Air Force and based in Honduras, moved Rogers to visit the people and see if she could help. Two months after her first trip, Rogers created KidSAKE Foundation. The nonprofit supports a decades-old children's soup kitchen in Cane, home to about 3,500 people." "[H]er Panamanian experience has her pledging to spend a part of every summer serving the Church of Christ mission in Panama." "'I'm going to keep going back on mission trips as long as I can,' she says. 'This first one really changed how I look at life.'" "To illustrate, she flips a photo album chronicling her journey to a shot of some wide-eyed kids, lining up for medical exams. 'Look at them. These are children from the children's home.'" "Megan, a member of Winchester's Owl Hollow Church of Christ, worked with folks from several churches to serve those kids and the adults who flocked to the gym that served as dormitory, worship center, exam room and pharmacy." "'When you're a kid, you're kind of, you know, 'I want this' and 'I want that,' but going on a trip like this makes you want to stop that.'" Metro Parks and Tango Nashville have partenered to present the FREE event 'Tango by Moonlight' to be held Saturday, May 13th, 2006, from 7:00 pm to 10:00 pm at the Event Shelter in Centennial Park. In May '05, 600+ attendees enjoyed this enchanting event! Join us again for a magical night of Argentine Tango as we come together for our 4th celebration of 'Tango by Moonlight'! This enchanting summer evening will include live music, dancing and tantalizing performances. Learn about the heath and wellness benefits of Tango, while de-stressing with family and friends in the refreshing atmosphere of Centennial Park. You can even bring a packed lunch and have your own picnic under the stars! This event is free. Dancing is optional for this event and no knowledge of dance is required to attend. U.S. Medicine reports in this article that Nashville's historically black Meharry Medical College has joined forces with the National Hispanic Medical Association (NHMA) and has also launched a Hispanic school. "NHMA announced a new partnership with Meharry Medical College in Nashville, Tenn., the largest private, comprehensive historically black institution for educating health professionals and scientists in the U.S."
"Meharry's president John Maupin Jr., DDS, spoke at the conference on the importance of training Hispanic medical students. 'I felt today is a different day,' he said when describing how he approached Meharry's board to see about allowing Hispanic students to apply. 'I felt we needed to bring our training beyond African Americans to individuals of color and poor communities, and disadvantaged backgrounds beyond race.'" "During the conference, Dr. Maupin and Dr. Rios signed a Memorandum of Understanding (MoU) to increase the number of Hispanic students, and pursue a mentoring program. 'We ought to be able to increase the opportunities for students,' he said. 'Partnering can draw more funding, [too].' Dr. Rios said the MoU is important and historic. 'We don't have a board of trustees like historically black colleges and to take the lead and help us is big, to improve the health of Latinos and black Americans,' she said. 'We need to fight for them and they need to fight for us.' Dr. Maupin added that a distinct school for Hispanic students was established at Meharry this year." This WorkingForChange article cites comments made on Nashville's SuperTalk 99.7 WTN radio as part of a nationwide trend toward violent rhetoric about illegal immigrants. "Those in attendance [at a so-called 'De-Magnetize Tennessee' meeting] heard Nashville radio talk show host Phil Valentine say that he thought that U.S. Border Patrol Agents should consider shooting undocumented immigrants as they come across the border." "According to the news story posted at the Web site of the Center for New Community's Building Democracy Initiative (here), Susan Tully, the national field director for the Federation for American Immigration Reform (FAIR) -- present at the event -- 'chuckled at the idea, while the large crowd erupted into applause'." "The meeting was hosted by Valentine and broadcast over SuperTalk 99.7 WTN radio." The WorkingForChange article further reports that "two civil rights organizations, the Southern Poverty Law Centre (SPLC) and the Anti-Defamation League (ADL)" have recently documented a "rise in both violence and the threat of violence against undocumented immigrants." According to this Newsweek article, the same sentiment has given birth to a videogame called Border Patrol, in which the player is armed and encouraged to "kill targets such as a 'Mexican nationalist,' 'drug smuggler' and 'breeder' (a pregnant woman with two small children) 'at any cost.'" The Building Democracy Initiative story describes Valentine's shooting comment in context and also contains a link to an audio excerpt (here). Valentine says, "Shoot him" in response to a description of what a border agent can and can't do when apprehending an illegal immigrant. The resulting chuckles and applause indicate that the comment was Valentine's attempt at humor and that it was well received by the audience. The Nashville City Paper's report of the event is here and contains no mention of the remark. Tennessee Congressman Jim Cooper warned against negative rhetoric in 2005 (story here), and Apprentice candidate and former Bush administration member Leslie Sanchez warned that despite a stated intent to target only illegal immigrants, negativism about immigration will accomplish alienation far beyond illegal immigrants (story here (this same story quotes another WTN talk show host in November 2005 as calling immigration a "vibrant issue" to be used as a political weapon in 2006)). The violent rhetoric has the potential to further isolate and divide immigrants in America, in the opinion of this Newsweek editorial: "Many Americans have become enamored of the European approach to immigration—perhaps without realizing it. Guest workers, penalties, sanctions and deportation are all a part of Europe's mode of dealing with immigrants. The results of this approach have been on display recently in France, where rioting migrant youths again burned cars last week. Across Europe one sees disaffected, alienated immigrants, ripe for radicalism. The immigrant communities deserve their fair share of blame for this, but there's a cycle at work. European societies exclude the immigrants, who become alienated and reject their societies. ... Beyond the purely economic issue, however, there is the much deeper one that defines America—to itself, to its immigrants and to the world. How do we want to treat those who are already in this country, working and living with us? How do we want to treat those who come in on visas or guest permits? These people must have some hope, some reasonable path to becoming Americans. Otherwise we are sending a signal that there are groups of people who are somehow unfit to be Americans, that these newcomers are not really welcomed and that what we want are workers, not potential citizens. And we will end up with immigrants who have similarly cold feelings about America." Immigrants have so far been non-violent in their protests in the U.S. No one knows whether an increasing atmosphere of violence from U.S. citizens will incite the kind of backlash experienced in Europe, or whether some immigrants will simply leave, as minorities have done in Boston in reaction to an unwelcome climate (story here), or whether they will continue to live among us in a society that looks for ways to exclude them. Valentine's efforts to de-magnetize or to polarize, or to simply make Music City or the Volunteer State unattractive, have put Nashville in a negative light nationally once again (the last time was the still-pending taco ban plan - story here). This comes at a time when Kiplinger's magazine has named Nashville as the #1 city in its national list of "Smart Cities," citing our Southern hospitality as one of the various reasons "Nashville keeps attracting people from across the nation" (story here) and Expansion Management gave Nashville the #1 spot in its "America's 50 Hottest Cities" rankings for two straight years (story here) - as a measure of "which cities their clients find most attractive when it comes to selecting an expansion or relocation site out of the nation's more than 360 metropolitan statistical areas (MSAs)." These rankings may be at risk if Nashville and Tennessee embrace a violent climate. After Nissan North America announced the move of its national headquarters to Middle Tennessee in 2005, a source inside the company said that the number one concern of employees about the region was diversity. Early speculation is that Nissan is going to suffer a "significant loss" and retain less than half of its workforce in the move (story here). As Reginald Stuart said in Nashville, an American Self-Portrait, "Nashville is at a crucial juncture in its history. We are not yet a truly diverse city, but we are about to become one, and the real question is, Can we do it right?" The Nashville Scene has picked up the syndicated Orange County Weekly column called "Ask a Mexican". Appearing at first to be a slur-filled exercise of ignorance, Ask a Mexican has earned support as biting, informed satire, according to this article in the Los Angeles Times. "'Ask a Mexican' is historically and culturally accurate, in some cases painfully so, while pushing the edges of modern political correctness. Its logo depicts a stereotypical Mexican peon, complete with bushy mustache, large sombrero and a single shiny gold tooth. "The column, published in 2004, was meant as a one-time spoof, but questions began pouring in." "Why are there so many elaborate wrought-iron fences in the Mexican parts of town? What part of the word 'illegal' do Mexicans not understand? Why do Mexicans pronounce 'shower' as 'chower' but 'chicken' as 'shicken'?" "'There isn't any politically correct bridge that you have to walk over; you're just right there,' Sasha Anawalt, director of arts journalism fellowship programs at USC's Annenberg School for Communication, said about Arellano's column. 'His writing kind of tackles you.'" "At times, it can also sound like the work of a graduate student — which Arellano once was. His response to the 'shicken' question included references to native Indian languages and linguapalatal fricatives." "But under it all, 'Ask a Mexican' is imbued with affection for Mexican immigrants, which may explain its appeal among Mexican Americans who might otherwise take offense." The May 4 edition of the column in the Scene is here. Update May 22: This story on WKRN reports on the feature's appearance in the Scene and one reader's disapproval. The Tennessean reports in this article on a series of legal rights forums directed at Spanish-speaking immigrants and sponsored by the Nashville Area Hispanic Chamber of Commerce and the Tennessee Human Rights Commission. Members of minority communities who are not fluent in the English language often are unaware of legal rights offered to them by State and Federal agencies. The Nashville Area Hispanic Chamber of Commerce has partnered with the Tennessee Human Rights Commission to present a series of Spanish language forums to address problems common to the Hispanic Community. The Tennessean reports in this article about the transformation of Cinco de Mayo from a minor Mexican holiday into a major U.S. event that unites and embraces the various Latin American cultures. A healthy crop of Cinco de Mayo events will dot Middle Tennessee this weekend. Area churches are part of the celebration, partnering with two of the three local Hispanic chambers of commerce. Ponies, games, ride, food and fun. There is also a silent auction highlighting children's art, and baskets filled with items from merchants in the Glendale area. Glendale is Nashville’s first optional Spanish immersion school. Spanish is taught through the math/science curriculum and conversation. After 5 years the students can read, write and speak Spanish. Glendale offers English classes only. They emphasize the Spanish culture through art and music. Fort Campbell Blvd at Gate 4, Destiny Parks and Pavilions. Come help the Fort Campbell community Patrons can partake in authentic Hispanic food and drink, live music, Hispanic dance clinics and more. On May 6 the children can decorate their own Cinco de Mayo craft, take a ride on the hay wagon or a pony or jump on the inflatables. The inflatables will be available on May 6 only and wristbands will need to be purchased for $5 per child in order to jump. Friday: $2 armbands (for 18 and up, 17 and under free), Live bands & DJ, beer/Soda/Margaritas by Sportsman's Lodge Craft vendors and a wide variety of food for all. Saturday: $2 armbands (for 18 and up, 17 and under free) Walk to Iraq event - 10am. Live free entertainment includes live bands, a DJ, and hispanic dance clinics. Free kids crafts by CYS (for children 12 and under, while supplies last), Appearences by Buddy & P'Nut, Beer/Soda/Margaritas by Sportsman's Lodge Craft vendors and a wide variety of food for all. 798-4610 ext. 120. Fort Campbell is located between CLARKSVILLE, TN AND HOPKINSVILLE, KY, EXIT 86 OFF I-24. Fort Campbell supports the 3rd largest military population in the Army and the 7th largest in the Department of Defense. At 164 square miles (105,068 Acres), the installation is one of the largest in the world. Carnival, Games, Rides, Live Music, Food, & Business Networking! Supported by the TN Hispanic Chamber of commerce. Unlimited rides for $20, 20 tickets for $15 The carnival event offers rides, Ferris wheels, sideshow games, live music and Mexican food. Pinkerton Park on Murfreesboro Rd, Franklin, TN 37064. If you are on 65S, take a right at the Franklin exit onto Murfreesboro Road/96 and keep going toward Franklin square. The park is on the right just before the train tracks and before the square. There will be food, music, medical screenings, dental checks, haircuts, clothing give away, a ‘meet the press’ session at 2PM and lots of booths. Last year there were an estimated 3500 people. The Franklin Area Hispanic Chamber will be there to support the work that Pastor Jose Duran does with this wonderful festival. All annoucements on the stage will be in both English and Spanish. Mayor Tom Miller will make a special appearance. FOOD, DANCE, MUSIC and more!!! The immigration training for youth that had originally been scheduled for April 21 to 23 will take place this weekend, according to the following press release from the Tennessee Immigrant and Refugee Rights Coalition, the Fair Immigration Reform Movement ("FIRM") and the Center for Community Change. (Nashville, TN) As hundreds of thousands of immigrants and their supporters participated Monday in a wide array of activities that included petition signing, letter writing, voter registrations and vigils for fair and comprehensive immigration reform, hundreds of young people from the Southeast have joined the fight to push for passage of comprehensive immigration reform and the DREAM Act and enhance their advocacy and leadership skills during an intensive weekend training. Every year, tens of thousands of America’s brightest high-school graduates are prevented from pursuing dreams of a college education and a better future. These students, many of whom are valedictorians, honor students, class presidents, or student leaders, have had to overcome numerous barriers in order to succeed. Many were brought to this country as young children and have lived here almost their entire lives; but because they don’t have immigration papers, they face limited prospects for completing their education and working legally in the United States. The DREAM Act is federal legislation that would enable these students to adjust their immigration status, and pursue their dreams. Participants come from diverse backgrounds, with some likely to be directly affected by DREAM legislation and many others who simply want to help fix our broken immigration system. The training, the first of its kind in the South, will address the many sides of the immigration debate including the potential tensions between African American and Hispanics and the crucial role of young people in the history and future of all social movements. The curriculum includes the principles of comprehensive immigration reform, opportunities for participation in the immigration movement, the content of the DREAM Act, and a play on how a bill becomes a law. The young advocates and future leaders, united for one common goal, will immediately apply their training at a rally in support of the DREAM Act, which will take place on the corner of 21st Ave and West End at 2:45 on Saturday. Eager young students from Georgia, West Virginia, Florida, Kentucky, Arkansas, Mississippi, North and South Carolina and Tennessee will attend the Southeast training, organized by the Center for Community Change, the Fair Immigration Reform Movement (FIRM) and the Tennessee Immigrant and Refugee Rights Coalition (TIRRC).